For the back cover, we did some research, looking at several back covers from different bands including Artic Monkey, the 1975 and Bring Me The Horizon themselves. Doing research about this is necessary, so that I could create a good digipack that achieves versimilitude, and that I would know where to put every little detail such as the barcode, the record label, the tracks and the other CD details. 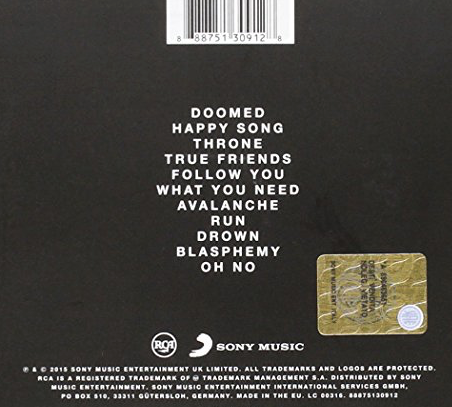 The one example from BMTH's "That's the Spirit", as you can see it on your left included 11 tracks, the barcode at the top and the record label and copyright details at the bottom. Since our digipak is going to include all of their best tracks so far, we are going to use tracks from each of their 5 albums. The thing that would make the most sense would be to use the songs that have the best hits. We are also going to create our own names for some tracks and invent new tracks, because fans will then be more likely to buy the album. Old albums with old tracks have already been used, so we should make the digipak as if we are trying to access the market with a new album, that fans would buy. We thought that this back cover is a bit too simplistic, because it is just black. Since we are using colored smoke in the music video we might want to include some either colored smoke or some grey/white colored smoke. Bronwen might also try to use some color effects on the smoke, which I will be doing another post on.